Between taking care of business needs and making sure patients are receiving the highest quality of care, it can be difficult finding time to build a marketing and sales strategy. That said, marketing and sales are a vital part of maintaining and growing the success of your business. Even if you’re a “high growth” organization, home care is such a personal industry dealing with folks’ loved ones. So, a referral from a trusted friend, contact, or relative can go a long way. Beyond that, incentivizing your clients and/or employees to provide referrals rewards them for their efforts. It also involves them in the success of the business. In 5 years, over 80% of internet content will be video. If a video builds your brand or generates leads, then it does not need to be professional-looking to be effective. If the video is authentic, honest, and feels “presentable”, then you hit the mark. It can be achieved with very little cost, time, or equipment. Plan time for video content, production, improvement, and repeating the process. Approaches could include an introduction by the owner or CEO, team interviews, a video tutorial, or something simple like a “Boomerang” video on Instagram or Facebook. If you need help with a marketing plan, then Kenyon Homecare Consulting can help you succeed. Call us at 206-721-5091 or contact us online for your free 30-minute consultation. Content excerpts were taken from the article by Jed Hammel on Ankota blog January 31, 2019. Ankota provides software to improve the delivery of care outside the hospital, focusing on efficiency and care coordination. Ankota’s primary focus is on Care Transitions for Readmission avoidance and on management of Private Duty non-medical home care. To learn more, please visit www.ankota.com or contact us. Marketing Specialty Services like chronic disease management, shows why you are different and better. Back up claims with top quality care so marketing efforts create long-term, upward-spiraling agency growth. Ok, so if your niche’ is your best marketing path, how do you move forward? Here are four ways to make your specialty services known. 1. Utilize Specialty Nurses to Sell Your Program. You want your marketing campaign to be distinct, client-focused, and targeted. The nurse specialist is key to helping promote the program. Wound care nurses communicate the benefits of your wound care program better than anyone. And who puts “personal touch” into ads better than the very person caring for the target market? And who knows the details of your program’s outcomes better than the nurses running it? Harness their knowledge with marketing material that promotes the benefits of the program. If you don’t already have an agency Facebook and Twitter page as well as a presence on You Tube, establish them without delay. Social media offers opportunity to create online relationships that can “discover” new clients. This happens through those directly following you as well as those looking for a potential provider. It is a great forum for interacting with clients and potential clients to understand major concerns and answer healthcare related questions. Use online blogs showcasing the detailed, high-level knowledge base your agency possesses, particularly in its specialty areas. Allow your specialists to be involved in writing material. Be sure your blogs are SEO-friendly so they are easily discovered in an organic search. Or, you can pay for your blog to appear at the top of the first page for keyword searches. The more people trust you, the more likely they are to entrust themselves or loved ones to you. Make sure your agency is worthy of that trust when your market! All of these approaches potentially lead to increasing referrals and “converting” new prospects. The more successful your programs are, the easier the strategy for marketing can be. To learn more or for timely advice on building your homecare specialty programs, contact Kenyon HomeCare Consulting online or by calling us at 206-721-5091. Tim Rowen and Home Care Technology Report (HCTR) are favorites of ours here at Ankota. Tim and HCTR are invaluable resources for folks interested in keeping up with innovations in the home care space. I subscribe to HCTR’s email list and receive regular informational emails from Tim that includes industry news, reviews, and thought pieces. A recent email I received from HCTR resonated with me as a marketer. In only a few sentences, Tim provided a number of ways to increase referrals for home care agencies. In his email, Tim thanked a home care agency for the excellent level of care that his mother is receiving. He also relayed a personal story to illustrate why he felt they were worthy of notice. This seems simple enough, so why did it resonate with me as a marketer? Long story short: It was a sincere and specific compliment based upon personal experience from an industry Thought Leader that was shared to an audience broader than the home care agency had already. In other words, it was free promotion to a wide audience from a trusted source with direct experience of the service. What agency wouldn’t want a recommendation from a trusted industry leader sent to an audience that is already requesting the information from that person? For the most part, the success of your agency begins and ends with providing exceptional personalized service to your clients and families. Whether it’s general word of mouth or a “shout out” by an industry leader, no one is going to recommend your business if they don’t feel that you truly care about the client and their family’s well-being. For veterans of the home care industry, you likely know this better than I. Beyond that, it’s likely that providing excellent service and caring about each individual client’s well-being is not an issue for you. Rather, the challenge is how to get the word out to prospects about all your great work caring for folks? An increasing number of us look to online review sites such as Yelp to inform us about a new service or product we are considering purchasing. I know folks in home care are often busy caring for their clients to do anything more than the basics for their online presence. But based upon how consumers decide to spend their money, having strong online reviews are important. If for no other reason than it is likely that your competition is working on improving their reviews, it is important that your business does as well. The easiest way to achieve this is to either ask clients that you feel are particularly happy with your service to write one. Also sending a mass email with your request can prove effective. Beyond Yelp reviews, here are a few online review resources you should look at. If you haven’t already looked, you may be surprised to find some reviews already posted! There are a number of industry experts, Key Influencers, Thought Leaders, social media mavens part of every industry who have broad and loyal followers. If you are active on social media, odds are that you’ve already connected with them in some way. Getting an endorsement, Mention, Retweet, or similar can often increase your web traffic, engagement, and the feeling that you’re “in the mix”. Ultimately though, if the goal is to increase revenue and create loyal customers, building trust with both Influencers and others “in your boat” is more important than a social media engagement metric. That is, while consumers do tend to look at things like total followers, that’s a pretty small part of their decision-making process when choosing their home care agency. What folks add into their process is outside opinions and Social Proof. And often what it takes to move the needle is simply providing value, support, and generosity to folks involved in your industry. Put simply, be a good online Citizen involved in your particular community. Getting a glowing review by someone who you’ve built trust with (Key Influencer or otherwise) will be easy. You’ve already proven that you are someone they want to help succeed and that your offerings can bring value to their followers. While being a good online Citizen and contributor to your online is important, I suggest that you do likewise in the real world as well. I’ve noticed some folks join their Chamber of Commerce or small business organization, they read the newsletter, and that’s about it. It’s unlikely that approach will create dividends for you. Building trust is the name of the game and that can only happen if you “show up”. So get involved, volunteer to help out on events or committees, get to know the business people both related to your field and outside of it…provide value. Often the folks that are already involved in these organizations continually meet a lot of other folks in the community or industry, and have built a wide network. If you do get involved, you might be surprised how often your name is the first one folks mention when others come to them for recommendations in your industry. Here’s a bit of a confusing mantra for you: “You don’t know who you know knows.” That is, folks you are connected to, who you wouldn’t assume could help build your business, could possibly be connected to a treasure trove of prospects. Beyond that, if you do build trust with other businesses in your field but who operate out of your area (or those parallel to your business), they will often be more likely to refer folks to you over your competition. They get to feel that they are bringing value to prospects who are outside of their expertise or local area. And the assumption is that you will do the same for them when a prospect in the opposite situation comes to your attention. The story behind this blog article began when I received an email from Tim. Or did it? Another way to look at it is that this article began when Tim continually provided value to the home care industry to the point where I noticed him as an industry expert. More to the point, this article would not have been written if A.) Tim hadn’t built trust with me to the point where I felt is was valuable for me to be on his e-mail list and if B.) the home care agency that he mentioned in his article hadn’t built trust with both him and his Mother. In whatever fashion you can muster time for, build trust through your level of care and your industry/community involvement, ask those who you’ve built trust with to provide reviews and recommendations, and finally, build your email list so that you can promote all your new glowing reviews! How do you build your email list? That will be a blog topic for another day. On a related note, download Ankota’s new e-book called, Winning with the Home Health Value-Based Purchasing Program. We are here to help! Call 206-721-5091 or contact Kenyon HomeCare Consulting if you need advice on marketing including increasing referrals. This article”6 Ways to Increase Referrals for Your Home Care Agency” by Jed Hammel, first appeared on Jan. 30, 2016 on the Ankota blog. Mr. Hammel is the marketing director at Ankota LLC. Ankota’s mission is to improve the efficiency and coordination of care outside of the hospital. Ankota provides software to improve the delivery of care, focusing on efficiency and care coordination. Care Coordination Concepts, Inc. provides practical approaches to help non-medical in-home care providers enhance their market position by focusing on delivering health maintenance value to clients and their health system providers. Cathy Meckes was co-founder and president of a licensed and Joint Commission accredited provider of private insurance and waiver program funded in-home skilled nursing, nurse care coordination and non-skilled supportive services. Cathy has written today’s blog (and the white paper below). Enjoy! Despite what seems to non-medical (supportive) in-home care providers to be an obvious contribution to effective transitional care, hospital and physician providers are slow to build supportive in-home care into their transitional care processes. That’s frustrating but, why would we expect providers to recognize a supportive services role in transitional care? They still don’t recognize in-home care in many other parts of the health care system! However, that can change as providers expand their focus beyond acute care to health maintenance. This is where supportive services have the potential for greatest impact. Health maintenance is emerging as the focal point for provider systems moving towards quality outcomes based reimbursement systems. Now is the time to establish your role in health maintenance with the goal of ongoing, long-term payoffs. The in-home care providers who contributes to health maintenance, will have a role in transitional care. Because most patients will require moving through a maintenance phase following an acute care episode, you win. Non-medical home care providers can earn a role in long-term health maintenance. Others on this road include; patient-centered disease care, case management, preventive and long-term home health, and tech systems monitoring red-flags. But, being a part of the system requires development of processes mirroring those of established participants. And delivering the quality outcomes providers are seeking. Consider employing a nurse or social worker to set up and oversee your non-medical care. This may increase the professionalism of your assessment. But more importantly, it will provide an effective peer to peer contact for other professionals involved in your patient’s care. Involve providers in your staff training. In regards to critical skills for health maintenance, medication compliance, recognizing and reporting red flags, is especially significant. Upgrade your client information system to provide enhanced assessment tools, red flag alerts, periodic care summaries and outcomes data. Health maintenance is the place to be, not just for patients, but for non-medical in-home care providers. As provider payment systems continue to move toward risk and quality-based provider reimbursement, provider attention will move towards health maintenance and resources will follow. Therefore, the in-home care providers who have established processes that incorporate effective leadership, appropriate collaboration and best practices will earn a role in a system focused on health maintenance. Cathy has recently written a whitepaper, “Non-Medical Supportive Services: Establishing a Role in a Heath-Maintenance-Focused System.” Download it here for free by clicking the title above. This blog first appeared on September 19, 2016 as “5 Tips to Get Your In-Home Care Agency on the Healthcare Radar Screen” posted by Ken Accardi. Ken founded Ankota LLC to improve the efficiency and coordination of care outside of the hospital. Ankota provides software to improve the delivery of care, focusing on efficiency and care coordination. Ankota’s primary focus is on Care Transitions for Readmission avoidance and on management of Private Duty non-medical home care. Is Your Home Care Sales Pitch Focused On What Really Matters? I grew up in my career at GE Healthcare as a technology guy and I wasn’t at all involved in home care sales. When I left GE to work in a tech company, my role was in technical sales support. Meaning I worked with the sales team doing demos, project scoping and answering technical questions for prospective customers. In observing the sales team, I was concerned that they were often focused on the wrong things. But since I was new to the world of sales, I presumed that I just didn’t understand sales. In hindsight my gut was right. I recently came across an article written by Mark Roberge, a senior lecturer at Harvard Business School (HBS) and who also works at HubSpot. Also the company that Ankota uses for our website, blog and marketing automation. The article is called Are You Discussing What Your Buyers Want to Discuss? Or What You Want to Discuss? I usually try and provide a link to the original article, but in this case it came to me as an email and I couldn’t find it online. I was however able to find a link to a book review on Mark’s book entitled The Sales Acceleration Formula. Are you discussing what your customers care about? 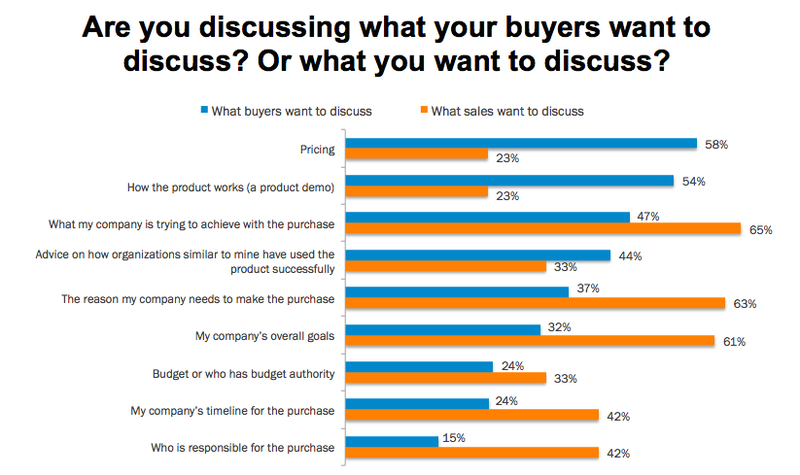 Mark’s article included the graph below that compared what customers want to hear about with what sales people want to talk about. As you can see, they’re not well aligned. Finally, now back to my first sales experience that I mentioned above. Most sales guys focused a lot on a concept called “BANT” which stands for Budget, Authority, Need and Timing. The sales meetings mostly focused on the B and the A. “Do they have a budget for this?” and “Who has the authority to buy?” were the main questions. The one customer focused piece, “need,” got the least attention. Then timing was discussed but it wasn’t from the customer’s perspective and rather was “you need to pull this deal into the quarter.” The picture above shows that the BANT components are the last things that customers are interested in. How Does This Relate to Home Care Sales? Price is very important to customers: If you are a low price agency you should highlight this. If you’re a higher priced agency, you need to focus on your differentiation and the added value. Use stories to explain how your service works: How the product works is listed above as the second most important concern of customers. Rather than walking through your brochure (which is likely not highly differentiated), tell stories of how you have helped similar customers and how it delighted them. “Yes We Can” should be your answer to special requests: If you are a private pay agency one great way to differentiate would be the a “yes we can” attitude. Think of the case of a family member who flew into town when their mom fell and injured her hip. This family member doesn’t know how to get services in your area, but you do. So if they ask if you can install grab bars, or cut the grass, or get the dogs in a kennel, or drive their mom home from the hospital, if you answer “yes we can” (and charge for the service) then you’ll be satisfying the customer, making a few extra dollars and maybe even establishing good partnerships with others who will refer to you. For more best practices, you can download a free eBook Seven Habits of Highly Effective Home Care Agencies here. Today’s post is by Ken Accardi, who is sometimes referred to as the “Home Care Software Geek.” Ken founded Ankota LLC to improve the efficiency and coordination of care outside of the hospital. Ankota provides software to improve the delivery of care, focusing on efficiency and care coordination. Ankota’s primary focus is on Care Transitions for Readmission avoidance and on management of Private Duty non-medical home care. This article first appeared as “Are Your Home Care Sales Reps Focused on What Matters to Clients?” on Aug 13, 2016 via the Ankota blog. As Elizabeth Houge, our esteemed colleague and well-known health care attorney explains in this article, hospital Preferred Provider Agreements continue to be misunderstood. But, many hospitals refer patients on a regular basis to post-acute providers. These include home health agencies, private duty home care agencies, hospices, and home medical equipment (HME) companies. Relationships with post-acute providers assist hospitals to control costs and avoid penalties, an essential component of financial viability. Consequently, positive relationships with post-acute providers are increasingly important to the success of hospitals. Many patients, however, do not yet know enough about post-acute services and providers to be able to make choices. When attending physicians indicate that they prefer certain post-acute providers and patients do not wish to choose other providers instead, physicians’ preferences/orders must be honored. Unless patients or physicians choose post-acute providers, it is permissible for discharge planners/case managers to make suggestions. Then patients may wish to choose post-acute providers with which hospitals have preferred provider relationships. Hospitals, if desired, may recommend ‘preferred providers,’ that is, high quality PAC (post-acute) providers/suppliers with whom they have relationships (either financial and/or clinical) for the purpose of improving quality, efficiency, or continuity of care. NOW IS THE TIME FOR ALL POST-ACUTE PROVIDERS TO WORK WITH HOSPITALS AND OTHER REFERRAL SOURCES TO ESTABLISH PREFERRED PROVIDER RELATIONSHIPS!